3 Bedroom End of Terrace Cottage For Sale in Yeovil for Asking Price £295,000. A wonderfully presented character property which is built from brick elevations with a slate tiled roof and has been elegantly extended to incorporate an additional bedroom and en-suite bathroom. The accommodation has been sympathetically updated throughout the years and comprises: Living Room, Dining Room, Kitchen and en-suite bedroom to the ground floor and a further two bedrooms and bathroom to the first floor. 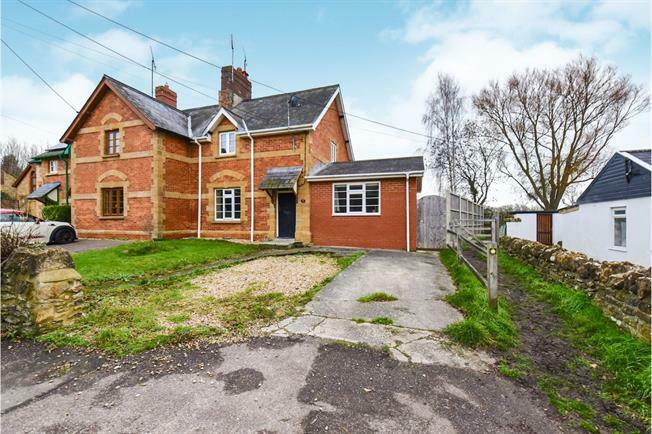 The property is situated on a delightful plot that offers ample parking to the front and a well kept predominately lawned garden to the rear that backs on to fields. Despite the age and characterful nature of the property, it is not listed and therefore benefits from double glazed windows. Fitted with an elegant range of white fronted base and wall mounted units with oak worksurfaces over, incorporating low level electric oven and hob, belfast sink with mixer tap, dishwasher and washing machine. There is also tiling to splash prone areas, window to rear overlooking garden and radiator. There is also a door to the side providing access to the rear garden. With white suite comprising pedestal wash hand basin, low level WC and shower cubicle with tiled surround and fitted shower. The room is presented with tiled flooring and a window to rear. With window to rear, radiator and access to loft hatch. With window to front, feature fireplace and radiator. With window to rear and radiator. With window to side and access to airing cupboard with slatted shelving and housing hot water tank. There is also a white suite comprising low level WC, pedestal wash hand basin, heated ladder towel rail and a panelled bath with wall tiling.